Disney To Put Limits On Food Ads In Bid To Nudge Kids To Eat Healthier : The Two-Way With an endorsement from first lady Michelle Obama for its effort, Walt Disney Co. said it is going to apply new standards to food ads aimed at children and their families during programming for kids. The goal: inspire healthier lifestyles. With an endorsement from first lady Michelle Obama for its effort, Walt Disney Co. confirmed this morning that it is going to apply new standards to food ads aimed at children and their families during programming for kids. The entertainment giant says it will try "to inspire kids to lead healthier lifestyles." Mickey thinks kids should eat better. The changes, which go into effect by 2015, apply to "all food and beverage products advertised, sponsored, or promoted on Disney Channel, Disney XD, Disney Junior, Radio Disney, and Disney-owned online destinations," the company said. According to The New York Times, "the restrictions on ads extend to Saturday-morning cartoons on ABC stations owned by Disney." -- Fewer or less than 130 calories. -- Less than 10 grams of sugar. -- Zero grams of trans fat. Disney claims to be "the first major media company to introduce new standards for food advertising on programming targeting kids and families." In a statement, the first lady called the company's decision "truly a game changer for the health of our children." Some nutritionists are also praising Disney's effort. "This is landmark, because a major media company is taking responsibility for what food they advertise to children," Margo Wootan, director of nutrition policy for the Center for Science in the Public Interest, told USA Today. "Under a voluntary agreement, beverage companies have pledged to improve advertising directed to kids. But 'our results clearly show that the beverage industry's self-regulatory pledges are not working,' says Kelly Brownell, director of the Rudd Center, which studied children's and teens' exposure to TV ads for soda." Also, Disney's program, as we said, applies nutrition guidelines that come with small suggested serving sizes that many parents will agree are hard to enforce on hungry and thirsty children. And, Wootan told USA Today, "there are still going to be SpaghettiOs and things like that in the mix," especially if they come with "better-for-you" promises. Disney also announced today that it is going to "further reduce sugar and sodium" in the foods it licenses and sells at its parks. In addition, it is introducing a "Mickey Check" icon "that calls out nutritious food and menu items sold in stores, online, and at restaurants and food venues at its U.S. parks and resorts." Later today, All Things Considered is set to have more on the story. We'll add to this post from its report. Click here to find an NPR station that broadcasts or streams the show. Update at 3:30 p.m. 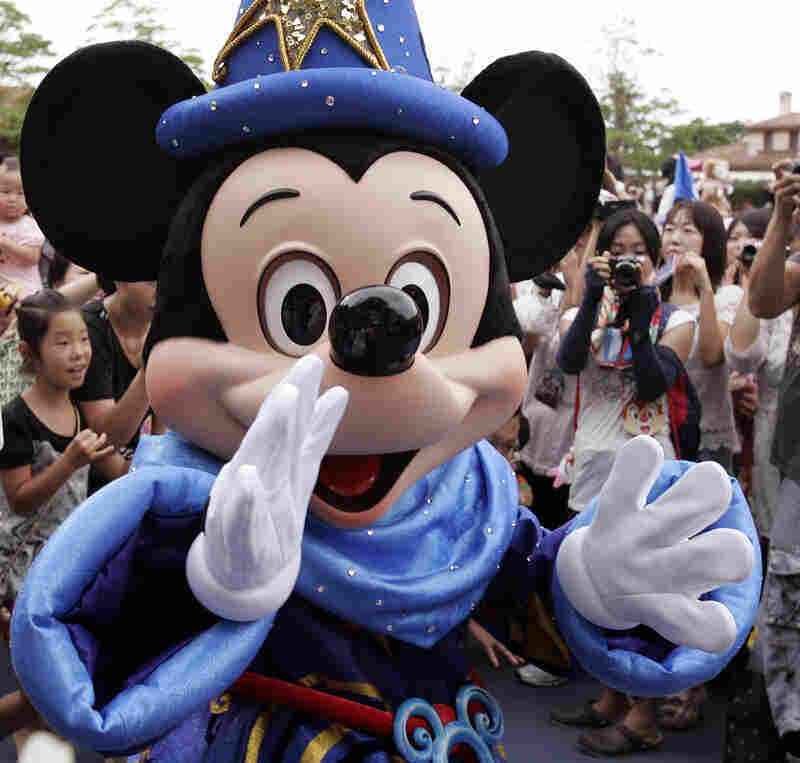 ET: Nutritionist Marion Nestle told All Things Considered co-host Robert Siegel that Disney's decision "is a big deal. Disney is an enormous company with enormous reach" and this effort will "send a signal to a lot of other companies to do the same thing." But, she added, "I want to see what's going to happen in practice," not just the promise.